Each order will be custom and unique! Shoes shipped within 15 days! 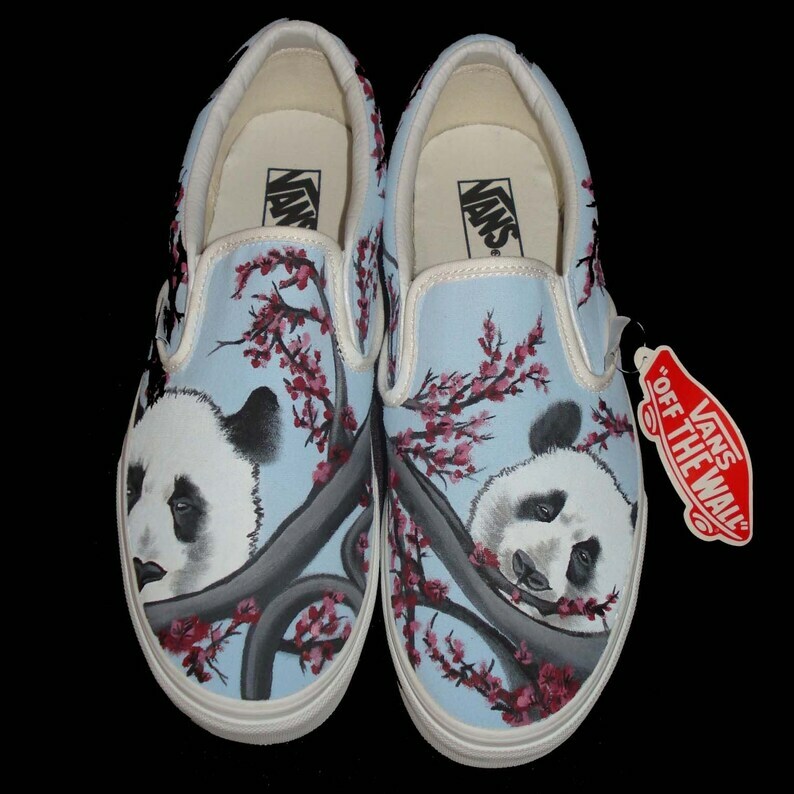 I paint on shoes that are canvas material, this listing is made with the brand Vans, but if you prefer a different brand such as Tom’s Shoes, Keds, etc. send a convo or email and I will quote you on the price. Generally I would charge for the price of the shoe + $115.00 for labor. If it is made of canvas material, I can paint on it. All shoes are wearable and waterproof. With normal use, the paint on the shoes will last as long as the shoes. The paint will NOT wash off with regular use, and can be spot cleaned with a mild soap. I ship with USPS priority mail with tracking. Shoes are packaged carefully in the box with receipt. If you wish for different shipping options, please let me know at purchase or ahead of time. I bought these shoes as a Christmas gift for my girlfriend and they arrived on time and wrapped with Christmas wrapping paper. The finished product was even better than the pictures. Exquisite art work and attention to detail! She loves them so much! Love these shoes!! I was thrilled with how beautiful they were when I opened the box! They are even nicer in person than in the picture. I love them! The payment methods I currently accept are electronic only. This includes PayPal or by debit/credit card directly through Etsy. The debit/credit card feature may add an additional 1-2 days for processing of your orders. PayPal is the one of the methods I currently accept. You do not need to have a PayPal account to use the service! For those of you who wish to purchase something but don't have a PayPal account, here's a helpful link. Click "Pay with PayPal" at the end of the checkout process. Even if you don't have a PayPal account, you can use their service to simply use your credit or debit card. When using PayPal with an e-check, please do keep in mind that there is a 3 - 5 business day wait for the check to clear (This is the time frame set by PayPal). Shoes will be started or shipped once funds are cleared. I want you to be happy with your purchase! If you are in anyway unsatisfied please contact me directly and I will absolutely work to accommodate your needs. Please make sure to contact me within 7 days from the date you received your item if there is a problem. And of course... all feedback is appreciated! All shoes are shipped out of Alaska with secure wrapping to ensure no damage. I currently use the United States Postal Service Priority shipping. -Custom Shoe Orders will be shipped as agreed upon during the creation process. Delivery confirmation is included with all packages, in exception to smaller end items (but can be purchased upon request). To avoid shipping to the wrong address, please be sure that your Etsy and PayPal addresses match. Otherwise, send me a convo or email the same day of purchase to clarify. International customers are responsible for any customs fees incurred at the time of delivery. International shipments are not considered lost until 6 weeks has passed from the mailing date. 100% satisfaction guaranteed during creation process. To place a custom shoe order, please send me a message to discuss your ideas for the shoes. I am very open to all ideas and will let you know what my capabilities are. Any and all references are preferred such as pictures, sketches, poems, etc. If you prefer to communicate by e-mail or phone, just let me know. When we agree on the idea and the time frame for shipping, I require a deposit for the cost of the shoes only (This can be found under "Your Idea on a Shoe.”) Once the funds are transferred through PayPal and cleared, I will purchase the shoes and start the painting process. During this time I will be communicating with you on the progress and ask any necessary questions to complete the project. I will also send you pictures of the shoes during the process to be sure that I am painting them correctly and to your expectations. Please be sure to give me the most convenient means of communication for you or the project could be delayed. If you are not a regular user on your Etsy account, I would suggest an e-mail as a reference. Once you and I agree that the shoes are to your 100% satisfaction, I will then ask for the remaining amount for labor and shipping as agreed upon. There are two ads under the shop section “Your Idea on a Shoe” to where you can place your shoe deposit and the remaining funds required. If the cost of the remaining balance is more then $100.00 for painting, I will make a reserved listing on my shop or ask for a money request through PayPal to your email address. As soon as the funds have cleared, I will ship your shoes.